Sanding Band covered with 60 grit aluminum oxide abrasive. Use for rough shaping, smoothing wood or fiberglass, removing rust from metal surfaces and shaping rubber surfaces. Bands are easily replaceable on drums. Do not use in excess of 30,000 RPM. 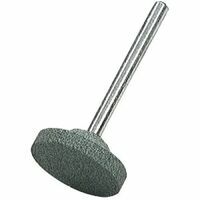 Dremel Grinding Stone, 25/32 in Diameter, 1/8 in Arbor/Shank, Silicon Carbide Abrasive, Silver, For Sharpening, Deburring and General Purpose Grinding on Harder Materials Polish silverware to high luster, car detailing and restore door and window hardware. Compatible with all Dremel rotary tools, EZ402 EZ Lock mandrel and standard 402 mandrel (619.9400). Do not run in excess of 30,000 RPM. Cuts wood, plastic, fiberglass, drywall, laminate and aluminum and vinyl siding. Do not run in excess of 30,000 RPM. For cleaning, light sanding and removing tarnish from brass. Use on metal, glass, wood, aluminum and plastics. For use with the EZ402 EZ lock mandrel (SKU #482.4447) or standard 402 mandrel (SKU #619.9400). Includes 2 fine 320 grit buffs. Ideal for cleaning and removing rust and corrosion from items made of brass, copper, gold or other soft ferrous metals. Perfect for getting into hard to reach places like slots. You can also use wire brushes to create an artistic effect on coarse-grained wood. Its shape makes it well suited for cleaning flat surfaces. Ideal for cleaning and removing rust and corrosion. Use on items made of brass, copper, gold or other soft ferrous metals such as tools, door knobs, automobile parts and electrical contacts. Can also use wire brushes to create an artistic effect on coarse-grained wood. Its shape makes it well suited for cleaning flat surfaces and getting into hard to reach places like slots. For No. 275, No. 285, and No. 395 Type 3, 4 and 5 Moto-Tools. Easily cuts off slots bolts, screws, sheet metal, thin wood and plastic, trim castings and molded ceramics. Cuts only along its edge. Do not attempt to sand or cut curved holes. Do not run in excess of 30,000 RPM. Use with No. 402 mandrel.